The ASX200BX, ASX1000, and ASX1200 provide an extensive suite of features and supports a wide range of network modules, allowing for future growth while protecting your investment. The redundant design of the ASX switches means there is no single point of failure, which translates to unrivaled network availability. With these capabilities, the ASX switches are ideal for customer premise equipment in enterprise applications as well as for WANs in large enterprises. 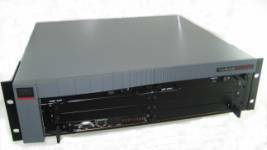 Just over 4 inches high,a used ASX200BX features a 2.5 Gbps switching fabric in a modular chassis that supports up to 32 ports. It is compatible with the most extensive line of ATM interfaces in the industry, including T1/E1 through OC-12c/STM-4. In addition, it supports Frame Relay, Circuit Emulation (CEM), 10/100 and Gigabit Ethernet, and Inverse Multiplexing for ATM (IMA). The ASX1000 and ASX1200 are modular and scalable from 2.5 Gbps to 10 Gbps. They support up to 128 ports of the same interfaces as the ASX200BX, and the ASX1200 adds support for OC-48c/STM-16. Designed for growth, the ASX1000 and ASX1200 are world-class multiservice broadband switches that support in-service expansion of port and switching capacity. All our used ASX switches offer advanced traffic management and shaping features to support efficient, low-cost networks. Given this tremendous flexibility, the used ASX200B used ASX1000 and used ASX1200 family is perfect for customer-located equipment and wide area networking applications.